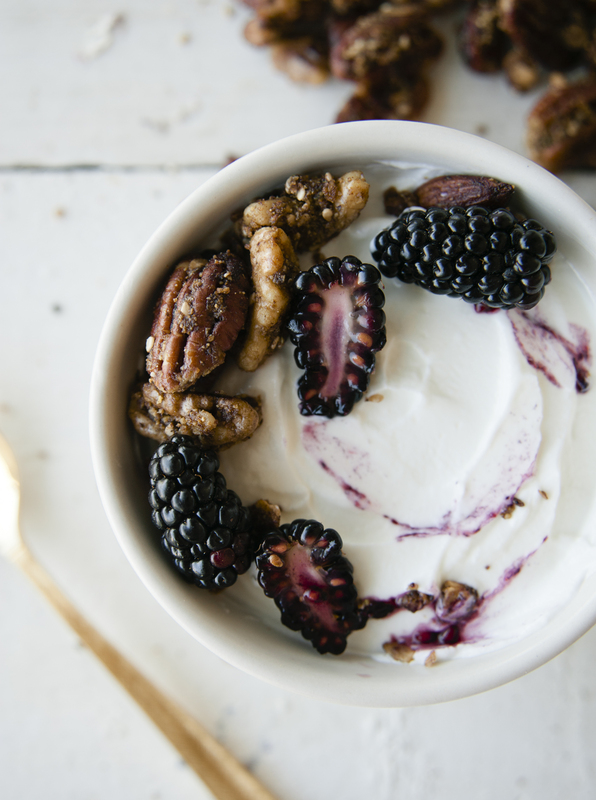 You will truly have a breakfast of champions with this delicious yogurt + granola situation. Homemade coconut yogurt is a fun alternative to the ever popular breakfast of chia pudding, and the probiotic twist gives this breakfast an added boost. 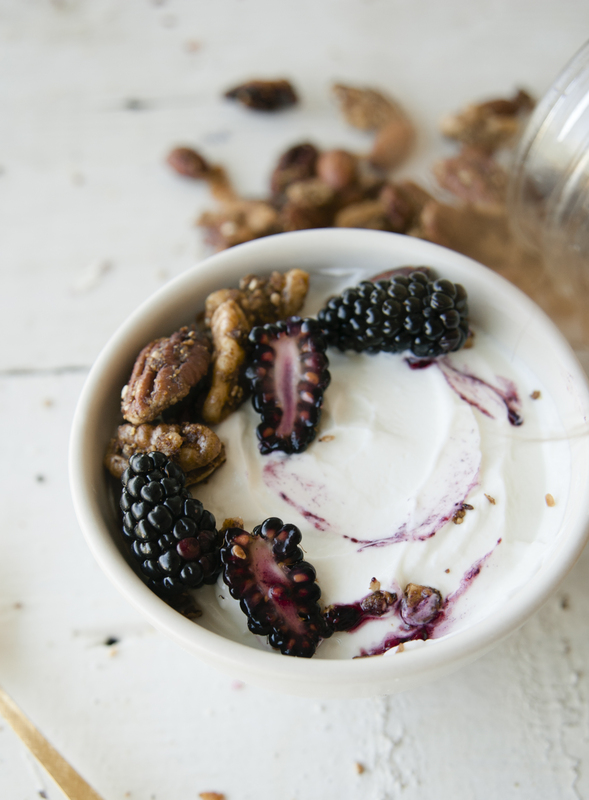 You can make this yogurt in larges batches, and have a fridge full of coconut yogurt for weeks! 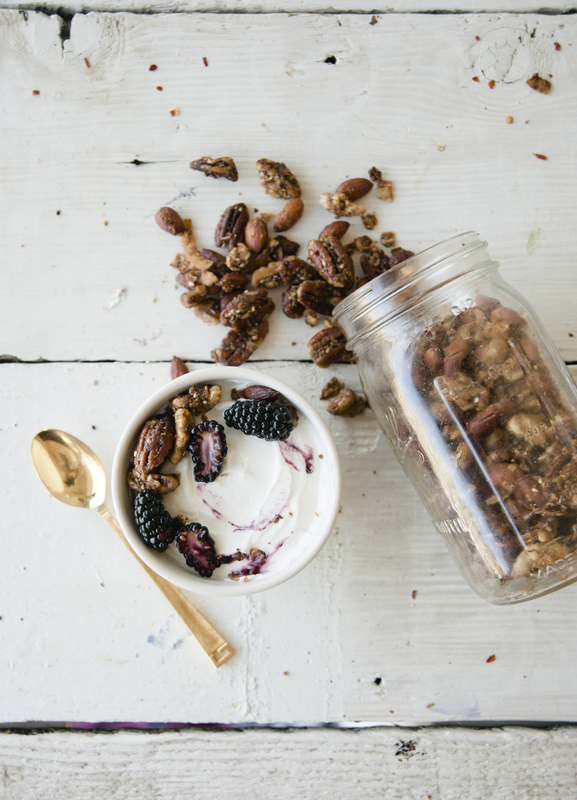 Granola is a classic, and has always been a favorite of mine. Feel free to swap in whatever nuts or sweetener you like. If you want to skip the yogurt making, purchase this yogurt. It is my absolute favorite coconut yogurt money can buy. Enjoy! Sterilize two glass jars and lids. Set aside. Place cans of coconut milk in a bowl. Whisk in optional cassava. Open probiotic capsules, and dump the inside powder into the bowl and stir well. Add the maple syrup. Pour into sterilized jars and allow to sit in dehydrator at 110 for about 12 hours. You can also place your jars in a turned off oven, with the oven light on, for 12-18 hours. 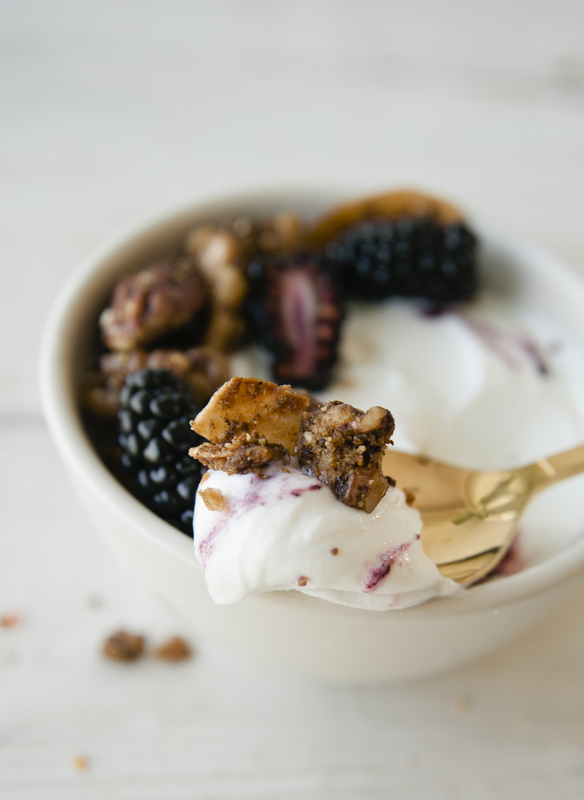 Top granola with beautiful berry and our delicious Grain Free Granola (recipe below)! Preheat oven to 375. Stir all ingredients until well mixed. Place on baking sheet and bake for about 10 minutes, or until desired crunch is reached. Allow to cool. Store in air tight jar. This entry was posted in breakfast, Uncategorized and tagged almond flour, almonds, baking, cinnamon, coconut, coconut milk, coconut oil, coconut yogurt breakfast bowls, dairy free, dairyfree, easy, fresh, gluten free, grain free granola, grainfree, maple syrup, paleo, pecans, pistachio flour, probiotic capsules, raw, refined sugar free, sesame seeds, sweet laurel, sweetlaurelbakery, tapioca starch, walnuts on September 30, 2016 by sweetlaurel. your photography here is absolutely beautiful! I love the use of gold utensils – it makes for such a warm ambiance. 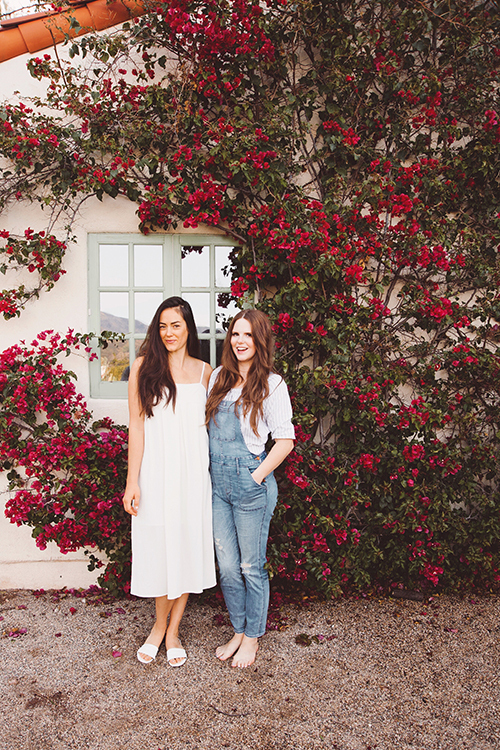 Thank you Katie!! 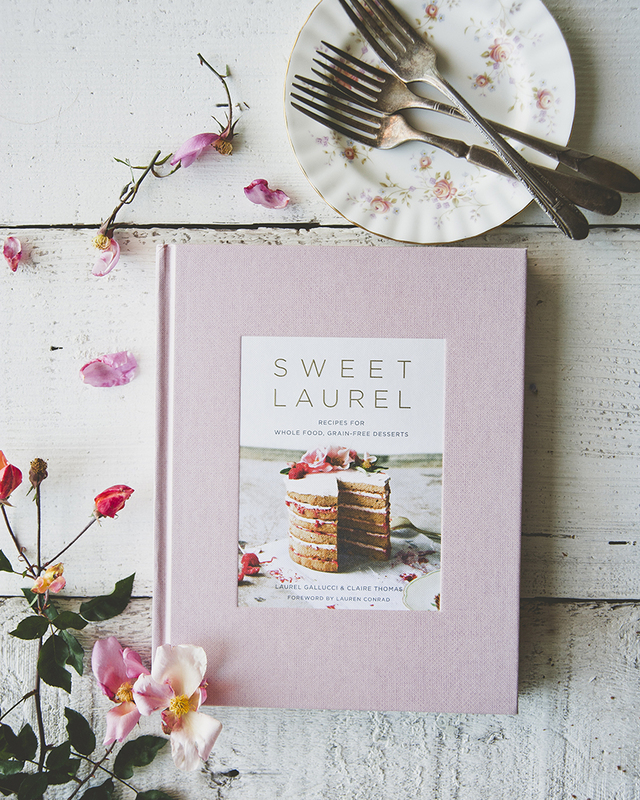 All our food photography is captured by Claire Thomas from The Kitchy Kitchen. She’s a gem! Also, this is my fave yogurt, I make it every week!